After a lovely holiday with the family in Eurodisney, we decided to go to this restaurant to watch the final of the football. On arrival, we sat at 2 tables that were unreserved..when the rude waitress realised we had children she told us the tables were reserved even though other tables had reserved cards on them and ours did not..she then started to shout at us and frightened the children by being very aggressive towards then..we were relieved to leave this restaurant and managed to calm the children down before arriving at the fab pizza di Roma across the road..don't usually write reviews but felt people should know what spalling customer service this restaurant has.. Took my family here after a long day at DLP. After reading reviews thought it was worth a try. Looked like there was a party beginning and was initially told there was no tables available. Our waitress then asked us to wait and she came back after a minute and cleared a table for us. Service was excellent even though it was obviously busy. Staff went out of their way to explain menu to us and tailor food to my wife and daughters individual requirements. 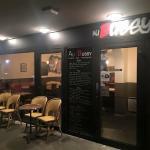 A lot of British establishments could take lessons from Aux Bussy on level of service. We still have a couple of days left in Bussy St Georges and will definately revisit. Arrived really really late after Disney Fireworks. Must have been close to 11 pm. I felt we were going to be told that the kitchen was closed but instead we were made feel very welcome. The staff member went over and beyond her duty to give us what we wanted and made us chicken nuggets and stuff that wasn't on the menu. Delicious steak and kids loved the milkshakes. The girl who was serving us is from Portugal and Brazil was lovely and felt like we knew her for ages wanted to bring her home with us!. Sorry now I didn't get her name. We visited second night. Will return if ever in Bussy St. George. Keep up the good work. Ta.